Easy Mac, a product of Kraft Foods, comes with a cup and a single serving of pasta and cheese sauce to which you add water and microwave. While the product may be convenient and quick to prepare, it contains additives that provide no nutritional advantage over traditional macaroni and cheese. A single serving of Kraft Easy Mac equals 58 g, and comes in a variety of flavors. Each flavor including, Original, Alfredo, Triple-Cheese, Bacon, Cheesy Taco and White Cheddar and Cheesy Pizza, takes approximately three to five minutes to prepare. One ¾-cup serving of Kraft Easy Mac has 230 calories, with 35 calories from fat. One serving has 4 g of fat, 2 g of saturated fat, 5 mg of cholesterol, 550 mg of sodium, 42 g of carbohydrates, 1 g of dietary fiber, 5 g of sugars, and 7 g of protein. 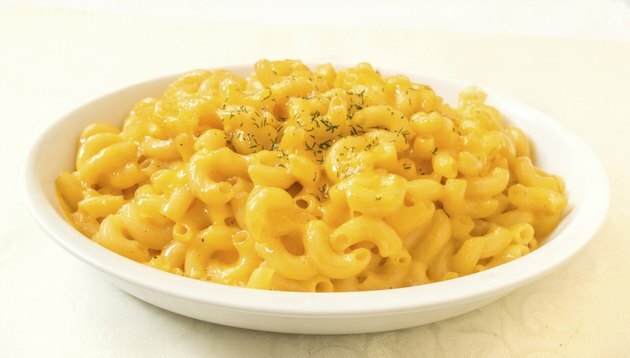 One serving of Kraft Easy Mac Macaroni and Cheese Dinner Triple Cheese has 220 calories, 4 g of fat, 2 g of saturated fat, 5 mg of cholesterol, 660 mg of sodium, 30 total carbohydrates, 5 g of sugars and 7 g of protein. All of the flavors have similar nutritional values. Easy Mac ingredients include enriched wheat flour, glycerol monosterate, niacin, iron, vitamins B1, B2 and folic acid. This product also contains cheese sauce made from whey, corn syrup, palm oil, maltodextrin, modified food starch, salt, milk fat, milk protein concentrate and calcium carbonate. Easy Mac contains less than 2 percent of medium chain triglycerides, sodium triployphosphate, whey protein concentrate, citric acid, guar gum, sodium phosphate, lactic acid, calcium phosphate, milk, apocarotenal, artificial flavor, artificial colors yellow 5 and 6, enzymes, cheese culture and natural flavor.